Thinking yet again about the weekly office meeting, I wanted to do something savoury. I sat and I cracked my head but I came up with blanks. And then I got to thinking about one of my favourite snacks ~ curry puffs! These yummy morsels are usually deep fried pastries filled with a curried filling, be it chicken, beef or just potatoes. If you ask me, the closest thing to Malaysian curry puffs would be Empanadas. Wikipedia says that empanadas ” comes from the verb empanar, meaning to wrap or coat in bread”. Curry puffs are eaten at anytime of the day but personally I like to have mine between the hours of 3 – 4 p.m with a cup of tea. Fillings vary from vendor to vendor. The pastry does too. Some have a mild chicken filling with half a boiled egg, while others are very spicy mince beef or sardines, or you get the vegetarian version of potatoes and onions. These days most people sell the potato variety coz it’s cheaper, and save the meatier varieties for festive holidays such as the holy month of Ramadhan. I like the fasting month of Ramadhan because at the end of the day we get to head down to the row of stalls, set up so that working parents can simply pick up some ready-made goodies to break their fast with, and buy local delicacies we usually only get once a year. 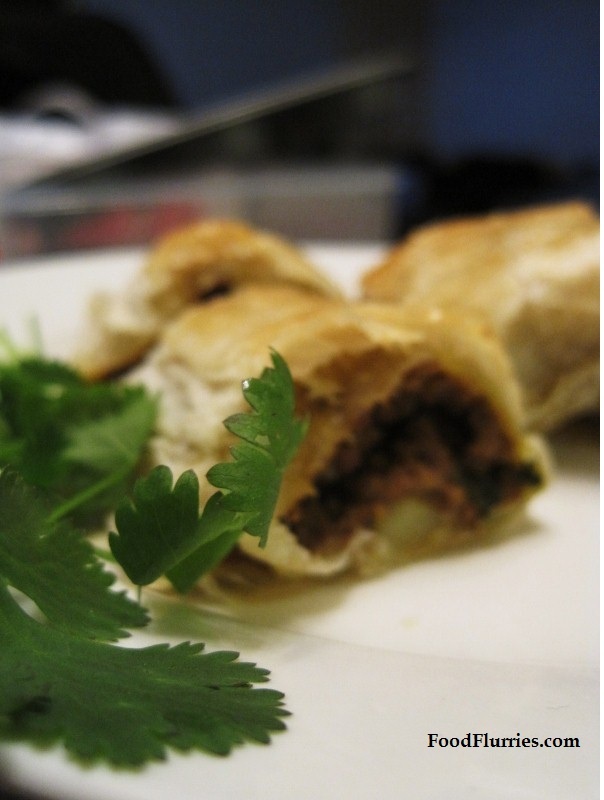 Curry puffs aren’t considered a once-a-year delicacy though … its street food. But for the office meeting I wasn’t going to roll out pastry, make the filling and fry each piece in oil. Oh no … too much going on there. I decided to make them like sausage rolls. Now sausage rolls were quite forgeign and unusual to me. I’ve had actual sausage in a bun before, but sausage meat in puff pastry?? I first sampled these aged 14; the place, my aunts place in England; the time was about 2 in the morning. My family and I had just landed in the UK all the way from Kuala Lumpur. It was a 13 hour flight and I did not sleep the entire time. It was my first ever trip overseas and I wasn’t going to waste a minute of it getting some shut eye. I sat in my seat watching movies and playing video games. My sister had the seat in front of me and she did pretty much the same as I … except she kept ordering food throughout the flight. She is always so hungry all the time. Anyway, back at my aunt’s place she whipped out this plate full of steaming log-like pastry, and they smelt delicious! Silly me, I asked her if she made them especially for us (hey, I meant to follow it up with a compliment! ), but she simply informed me they came out of her freezer from a bag. I believe TESCO was also mentioned. I would not encounter another sausage roll again until I made my way to Melbourne, Australia a decade later. Man, this country absolutely adores their sausage rolls. Bakeries sell them, cafes sell them, supermarkets sell them …. basically every retail outlet you can think of, including 7-Eleven. They even come in party pack boxes, ready frozen for your convenience. Just 20 mins in a moderate oven and you are all set to host that party. Now that I am in the Netherlands, I must say that it surprised me greatly to find sausage rolls being sold as abundantly as in Australia, and they are pretty darn good too! Well there you go … sausage rolls … everybody likes ’em! And they don’t necessarily have to be difficult to put together either. And why not mix it up? Try different fillings. Well I suppose then it cannot be called a sausage roll, but you get the concept. Soften onions in oil and sautee until semi-translucent. Then add cummin and tumeric powder, sautee about 2 mins. Add the beef mince and stir until they are all nicely browned. Add curry paste and stir to coat. Then add water and coconut milk. Season with salt. Take off the heat and stir in the corriander leaves and bread crumbs. Chill completely, and then put in the fridge for about 2 hrs. Spread out one sheet of puff pastry and cut into thirds, length ways. Roll filling into logs and place onto pastry sheet. Spread one edge with egg and roll over to seal. Place pastry onto baking sheet with seem-side down. Brush with egg wash.
Bake 20 – 25 mins. Cool on wire racks. Serve warm with my Minted Coconut yoghurt dip. Will post Corriander Yoghurt Dip in a seperate post, but it won’t be too far away. So give these a try and let me know how you go. So I know the staff meeting is not for another hour, but i noticed these delicious treats in the kitchen, just begging to be tasted.. Thanks again for the treat .. delicious! I am not much of a foodie, but I love the pics you are posting, they’re perfect! Best stuff I ever ate!! Delicious they are!